Whoever you are, this Sunday was probably a holiday. Christians celebrated Easter, Jews marked another day of Passover, and stoners celebrated 420, the chillest of secular holidays. 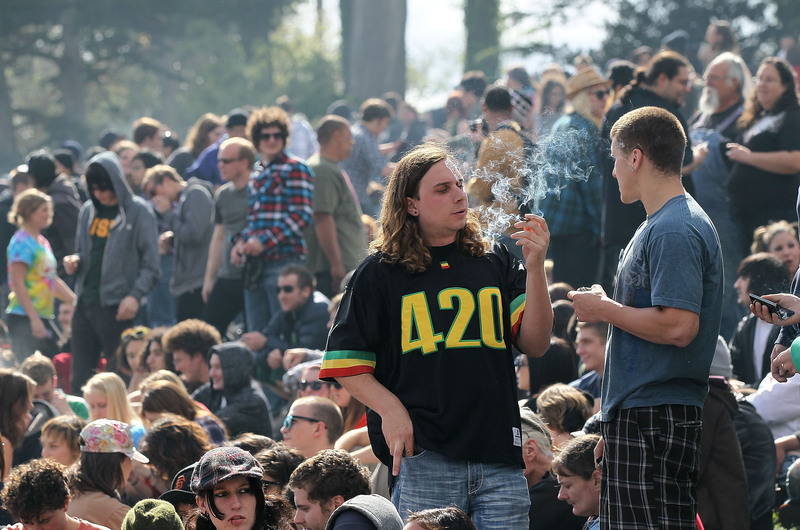 This year, they even had a place to gather: Denver, Colorado, for the city's annual 420 rally. Although the day has long been observed by marijuana enthusiasts, this will be the first time – and place – that it can be celebrated to its full extent anywhere in America. Tens of thousands gathered for a weekend of Colorado cannabis-themed festivals and entertainment, from a marijuana industry expo called the Cannabis Cup at a trade center north of downtown, to 4/20-themed concerts at the legendary Red Rocks Amphitheater – acts include Slightly Stoopid and Snoop Dogg – to a massive festival in the shadow of the state capitol where clouds of cannabis smoke are expected to waft at 4:20 p.m. MDT Sunday. All of this despite the fact that smoking weed outside is still not strictly legal. "We’re not Amsterdam," Deborah Park, spokeswoman for Visit Denver, told NBC News. "In Denver, you can’t smoke in public. You can’t smoke in a hotel. You can’t smoke in parks. We don't have cafes. So there’s just not a location for anyone who’s coming in for that as tourists." Tell that to the estimated 80,000 tourists in town for the weekend. J.J. Walker, owner of My 420 Tours, told the Denver Post that "besides the DNC [Democratic National Convention], I can’t picture anything bigger that people have really all come together for."